Some of you might assume the Geeky Chef has mad cake decorating skillz. Not so. I have horrible, sloppy cake decorating skills with an "s" instead of a "z." However, I am quite proud of how this cake turned out. Even if your own cake decorating skill(s/z) are not so great, I guarantee you can pull this cake off. Now, I am a huge vulcan-saluting, prime-directive-abiding, starfleet-loving trekkie. The Next Generation is my favorite Star Trek series, and Phantasms is one of my very favorite episodes in the series. In the episode the android Data has a program installed in his positronic brain so he can dream like a human. Apparently, androids do not dream of electric sheep, they dream of Deanna Troi cakes and brain slurpees. The cake is described by an uncharacteristically excited Worf as a "cellular peptide cake with mint frosting." The dream sequence is a delve into surrealism, jarringly unusual for the series, and it is absolutely hilarious. Here's a clip of what in my opinion is the best two and half minutes of Star Trek history. Cellular peptide isn't actually a thing, but it is described in the episode as a chain of molecules found in living things. The recipe I made is for a yummy moist white cake with some very blue mint flavored frosting. I used yogurt as a moistener for the cake itself because yogurt contains living bacteria. 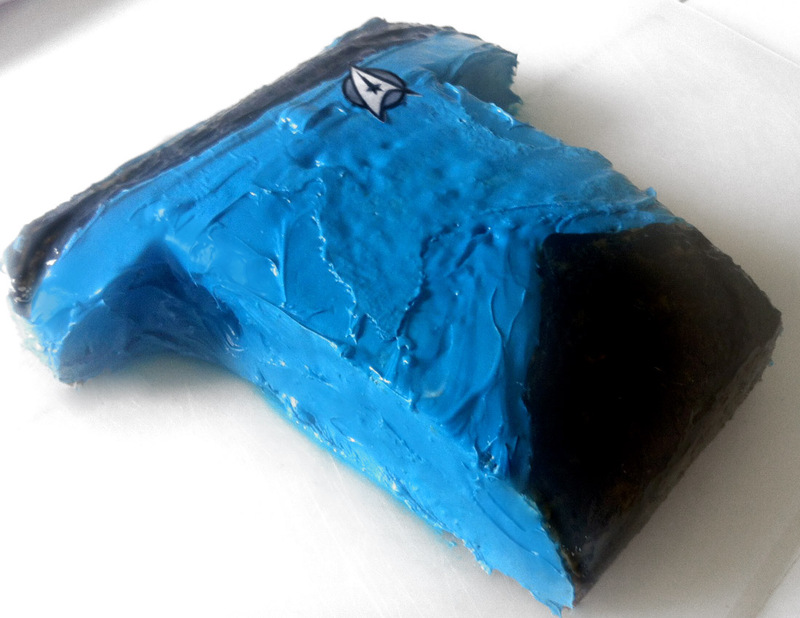 You can also go the lazy route and just buy pre-made white cake and pre-made frosting and add some mint extract to the frosting; The point is really to make the cake look like Deanna's starfleet uniform. Whether you make it from scratch or buy it pre-made, the cake will be mmmm... delicious. Preheat the oven to 350°F. Mix all of the dry ingredients. Add the softened butter and mix until crumbly. Add the egg whites, then the whole egg. Beat well. In a separate bowl whisk the yogurt with the two extracts. Add this mixture to the batter. Beat until fluffy. Pour the batter into a small square baking pan. Bake for 30-40 minutes or until a knife or toothpick inserted into the center will come out clean when done. Let the cake cool and set. While it sets, you should prepare the frosting. Mix all the frosting ingredients in the order listed in small bowl. Beat until you reach a creamy consistency. Add more sugar if the frosting is too thin. Split the frosting into two bowls. In one bowl, add the blue food coloring. You will need a lot to get a deep blue. In the other bowl, mix in the black food coloring. Cut off part of the sides to make a T or torso shape. Emulate this picture when frosting. That was my favorite episode too! You what they say about great minds: they make excellent slurpees! I always loved how Deanna gets back at the end. Yes! "I wonder what Dr. Freud would say about the symbolism of devouring oneself." "Data, sometimes a cake is just a cake." I'm making this tonight for my friend's birthday. Let's hope it turns out. I know this is a while back, but I hope it all went well! That is an awesome looking cake. Nice job! I am a big STNG fan. This was another very humorous episode featuring Data, and a great choice for your inspiration. I really enjoy the thought behind this blog (I put it on my blog's follow list as soon as I found it) I am looking forward to seeing what you come up with next. I will continue to refer others your way. Thanks for the support and enthusiasm! TNG fans are awesome people. This would go so well after an octopus gagh... if you like that sort of thing... I don't, it's a bit too wriggly. Ugh! The "brain slurpee" thing has popped up in my mind from time to time. I'm glad it was explained as a dream sequence or else I would have been REALLY freaked out as a kid. Currently I surfing about this topic and I got your blog its really helpful for me thnk u .
I am going to use this for a Star Trek party! This is so awesome. Cellular Peptide Cake! ( with mint frosting). I've recently submitted a few ideas to your "suggest box". Is there a chance you haven't seen them or are they just that bad?